This High Performance HDMI cable uses a Broadband digital cable, which guarantees optimal transmission of digital video and multi-channel audio signals. Ideal for DVD, HD-DVD and Blu-Ray players which demand a perfect transfer of digital video and audio signals, without loss in quality. 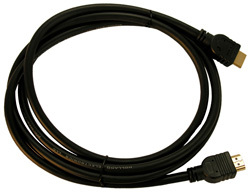 This cable can be connected to a high-definition LCD or plasma screen television. In addition, its high-density shielding reduces RF and electromagnetic interference, to make sure that you get the best connection every time!